E-Documents allow a participant to fill out a form while in the virtual waiting room, and electronically sign it. Users with an Account Administrator or Clinical Supervisor role can create/edit as many templates as needed, and delete templates as well. Common uses for these E-Documents include Statements of Understanding and intake forms. This support article illustrates how to create or edit an E-Document. Who Can See Completed Documents? Show to Your Clients Now? Click on the "Features" tab and select "E-Documents" from the drop-down menu. On the next page, use the "New Template" button in the lower left-hand corner. If you have already received E-Documents before, click on the "Edit Templates" button in the lower left-hand corner first, and then the "New Template" button on the next page. 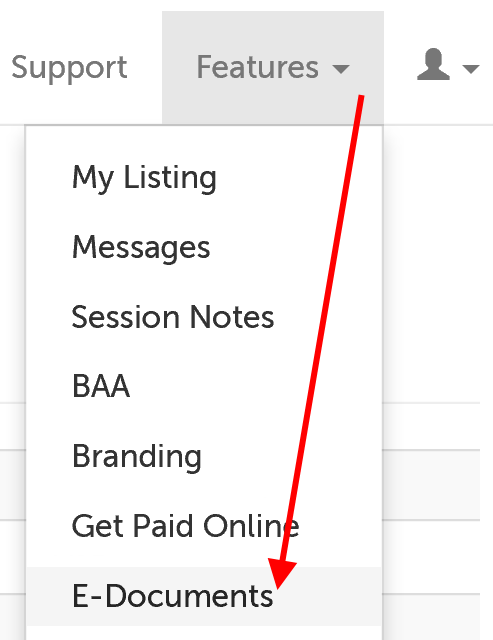 When you have filled out the document fields and entered your content, use the "Save and Preview" button in the lower left hand corner to save your changes and create your document. Check the preview for any design errors. On the next page, use the "Edit Templates" button on the left hand side. Use the "Edit" button to the left of the template you would like to edit. While on the create or edit screen, enter the name of the document as you would like it to appear on the waiting room page. All Session Participants: This selection means that ALL participants that have been invited to this session will be able to see if this form has been assigned to ANY participants, as well as view the form after it has been filled out. Select this option if you want to be able to allow participants to view and sign others' forms. For example, if this form is meant to have an additional signature for a parent or guardian, you can invite the parent/guardian to the session so that they can view and sign the form that their child submits. This field determines what type of signature field your participant will see. No: A normal electronic signature field will appear where your participant can type in their name. Clear Drawn Signature: Gives the participant the option to clear what they've drawn and re-do. Drawn Signature Not Working: If the field is not working with their touch screen device, they can dismiss the drawn image field and type their name into the regular signature box. This field determines if you want the form to be visible (i.e., active) or not. Yes: Make this form visible to session participants. Customer sort order (this field, if edited by customer): this field sets an ascending sort, so lower numbered documents will appear above those with higher numbers. You can create the document text using our Rich Text Editor. We will automatically add a signature field to the end of the document, so you do not need to include it in the document body. You can use the Rich Text Editor to format your document in a variety of ways. You can also format your text using pre-set headers by clicking on "Format" and selecting "Formats", which will slide out a menu of different header formats. Select the header that you like. SecureVideo has a number of different field types that you can use. Any field type can be marked as required. The field name for a textbox is not visible, so be sure to write the field name as you would like it to be displayed to your participant, outside of the curly brackets. If you only want to add a minimum (if text is entered), just include one number. In the example below, a submission must be at least 10 characters long. No maximum character limit is set, so the box is the the default width of 300px. To require the field be answered, add an asterisk before the second curly bracket. The field name for a text area is not visible, so be sure to write the field name as you would like it to be displayed to your participant, outside of the curly brackets. The default size for a textbox is 80px by 5px. To set a different size, add a colon and the number of column-pixels and row-pixels. In the example below, the text area would be 100 columns wide by 10 rows high. 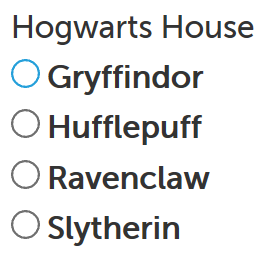 The field name for a set of radio buttons is visible to the person filling out the form. To set a default value, add a caret (^) symbol after it. (Only one answer is allowed, so you can only set up to one default value.) 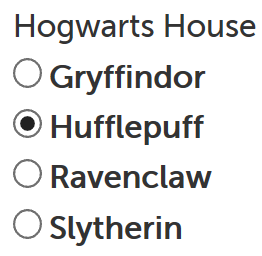 In the example below, "Hufflepuff" is set as the default value. 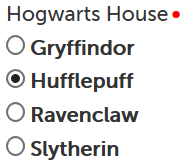 The field name for a set of checkboxes is visible to the person filling out the form. To make a date field, type the name of your field and "(date)" within 2 curly brackets. The date will require the participant to enter 4 digits for the year (but leading zeroes for the month and day can be omitted), and the system will also check that the date is valid (once the participant attempts to submit). The field name for a date is not visible, so be sure to write the field name as you would like it to be displayed to your participant, outside of the curly brackets. To set a minimum or maximum date, add a colon and the minimum and maximum date the answer should follow. In the example below, a date cannot have taken place before January 30, 2000, or after "today"; whatever today is. The date can be a specific date, or relative to "today". E.g., "today+3" is "3 days after today". "today-3" is "3 days before today", as determined by the participant's time zone. The field name for a dropdown field is not visible, so be sure to write the field name as you would like it to be displayed to your participant, outside of the curly brackets. The dropdown field is about as wide as the longest possible answer. To set a default value, add a caret (^) symbol after it. (Only one answer is allowed, so you can only set up to one default value.) In the example below, "Wonder Woman" is set as the default value. This article was last reviewed by our Support team on April 12, 2019.